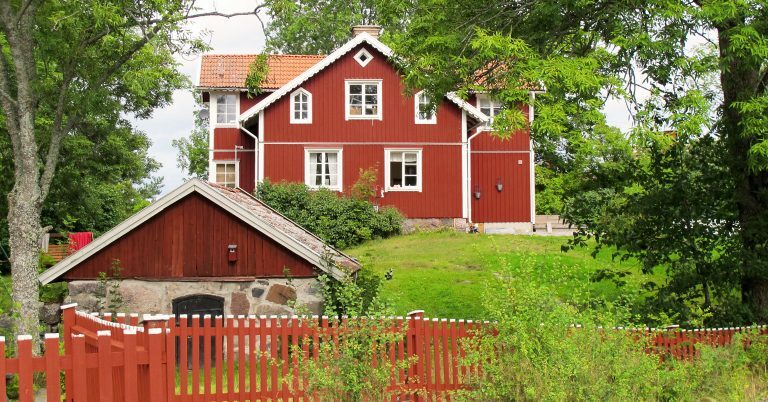 A farm that is open to visitors and that features exhibitions and a nature and culture trail has been created at Västergården on Hjälmö. The farm shows the significance of small-scale archipelago agriculture for the cultivated landscape and biodiversity. The Schierman family rents Västergården from the Archipelago Foundation. In addition to running a small-scale organic farm, they also work as conservationists and are trained archipelago guides. The farm has a breed of cows called Swedish Mountain Cattle, 50 Gotland sheep, a few chickens as well as dogs and cats. In the summer the animals graze in the reserve. In order to meet the animals from Hjälmö in summer, you have to go to Träskö-Storö, Lisslö, Västerholmen, Hästnacken or Norrgårdsön. Would you like to know exactly which island they are grazing on? Get in touch with Lill or Per and they will tell you. The farm shop is open on Saturdays from May to September. Here you can purchase various products from the farm such as sheepskin, but also arts and crafts from local artists. Between May and September, you can purchase products such as ice cream and eggs any day of the week by putting money in the honesty box. In the barn there is a permanent exhibition that tells the history of agriculture and the farm and how the jobs farmers do change along with the seasons. The exhibition has been produced with the help of local artists and craftspeople. There are paintings and models that depict seasonal changes on a small archipelago farm in the 1930s. 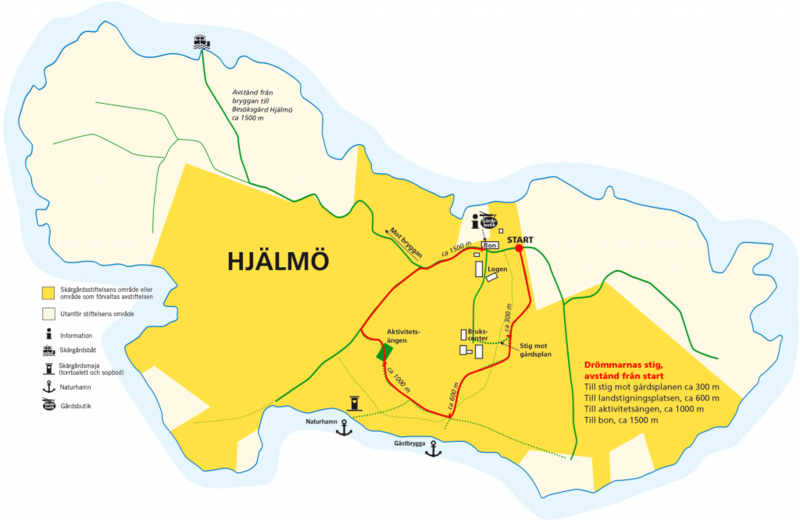 Along the time line you can read about agriculture on Hjälmö throughout the centuries. The trail of dreams guides you through the landscape shaped by agriculture and forestry. There are exciting elements for both children and adults. The trail is 1.2 kilometres long but it is possible to turn off and make your way back to the farm. Beside the trail is the “children’s forest and playing field” with huts, a balance trail, a playing field with football goals etc. Book a guided tour of Hjälmö Open Farm. The tour starts at the steamboat jetty and after 1.5 kilometres you have arrived at Västergården. You will learn about farming on the island throughout the centuries and in the present day. See the exhibition in the barn, walk along the trail, have your picnic and buy something from the farm shop. When the “Open Farm” project was being established, a biological cultural heritage inventory was carried out by the Swedish Biodiversity Centre (CBM). This material has formed the basis of the exhibition and the nature and culture trail. Interviews with older Hjälmö residents, research in farm archives from the 1750s, photos from island residents etc. have also been foundations for the exhibition and trail. The texts for the trail and the exhibition were produced by Lill Schierman, conservationist, in collaboration with Anna Dahlström and Tommy Lennartsson from CBM. Regular sailings from Stockholm with Waxholmsbolaget. SL bus to Boda or Sollenkroka on Värmdö, onward journey by archipelago boat with limited departures. There is a guest jetty in Lisslösundet. For longer visits, there is a natural harbour with a skärgårdsmaja (combined toilet and waste sorting station). N.B. maximum 30 people per group.